Crilley, D.M., Christenson, S.C., Anderholm, S.K., and Falk, S.E., 2011, Variation of ground-water levels, specific conductance, and temperature in shallow monitoring wells in San Luis Valley, Colorado: Implications for detection of long-term water-quality trends [abs. ], in San Luis Basin Geology and Hydrogeology Workshop: Alamosa, Colorado, June 14, 2011 [Proceedings]. Crilley, D.M. Anderholm, S.K., and Christenson, S.C., 2008, Variation in continuous ground-water level, specific conductance, and temperature data from monitoring wells in San Luis Valley, Colorado, 2004-2006 [abs. ], in U.S. Geological Survey National Ground Water Workshop: Denver, CO, August 4-8, 2008 [Proceedings]. Crilley, D.M. 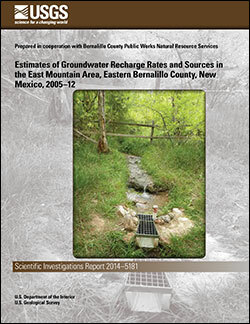 and Anderholm, S.K., 2007, Variation in continuous ground-water level and specific conductance data from monitoring wells in Rincon Valley, New Mexico, 2004-06 [abs. ], in New Mexico Water Resources Research Institute Rio Grande Project Salinity Management Workshop: Las Cruces, NM, March 1, 2007 [Proceedings]. Crilley, D.M., 2004, Dissolution of halogenated biotite from an acid-mine drainage site in Globe-Miami, Arizona, and its contributions to ground-water chemistry: Philadelphia, Temple University M.S. thesis, 172 p.
Crilley, D.M., and Grandstaff, D.E., 2000. Dissolution of halogenated biotite from an acid mine drainage site in Pinal Creek, Arizona [abs. ]: Geological Society of America Abstracts with Programs, v. 32, no. 7. Crilley, D.M., Glynn, P.D., and Angeroth, C.E., 1999. Oxygen-18 and deuterium in precipitation: Implications for ground-water recharge in Pinal Creek Basin, Arizona [abs], in Proceedings of the 12th annual Arizona Hydrological Society Symposium: Pinetop, Arizona, Sept 8-11, 1999, 6 p.
Rice, Steven E.; Crilley, Dianna M.
Rice, S.E., and Crilley, D.M., 2014, Estimates of groundwater recharge rates and sources in the East Mountain area, Eastern Bernalillo County, New Mexico, 2005–12: U.S. Geological Survey Scientific Investigations Report 2014–5181, 24 p., http://dx.doi.org/10.3133/sir20145181. Crilley, D.M. ; Matherne, A.M.; Thomas, Nicole; Falk, S.E. Seepage investigations of the Rio Grande from below Leasburg Dam, Leasburg, New Mexico, to above American Dam, El Paso, Texas, 2006-13; 2013; OFR; 2013-1233; Crilley, D. M.; Matherne, A. M.; Thomas, Nicole; Falk, S. E.